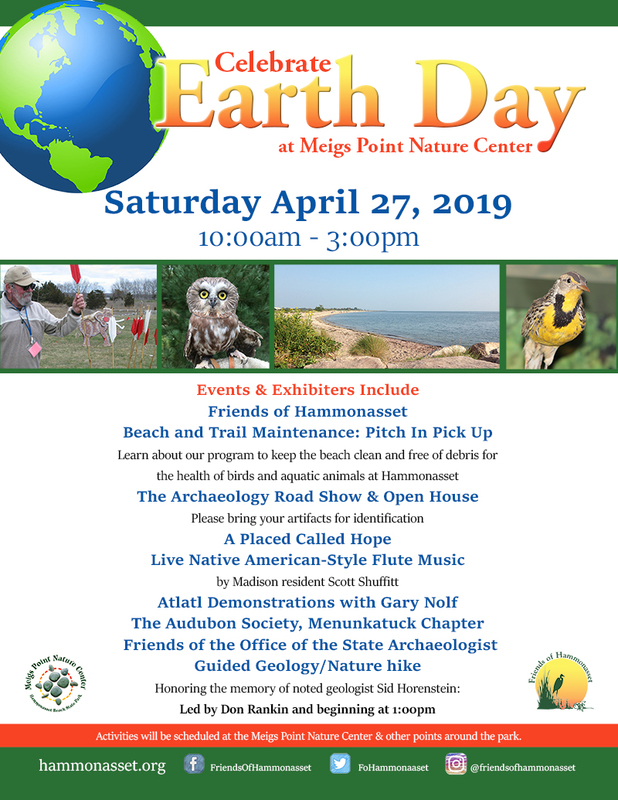 Hammonasset Beach State Park and The Friends of Hammonasset will be celebrating Earth Day on Saturday, April 27, 2019. The Earth Day Theme for 2019 is saving and protecting endangered species. Activities will be scheduled at the Meigs Point Nature Center and at other points around the park. The Archaeology Road Show and Open House at MPNC – Please bring your artifacts for identification. Beach and Trail Maintenance: Pitch In Pick Up- Keeping the beach clean and free of debris is important for the health of birds and aquatic animals. Please visit our table in the Nature Center any time between 10:00 am and 3:00 pm and help with some beach clean-up. Guided Geology/Nature hike honoring the memory of noted geologist Sid Horenstein: Led by Don Rankin and beginning at 1pm.